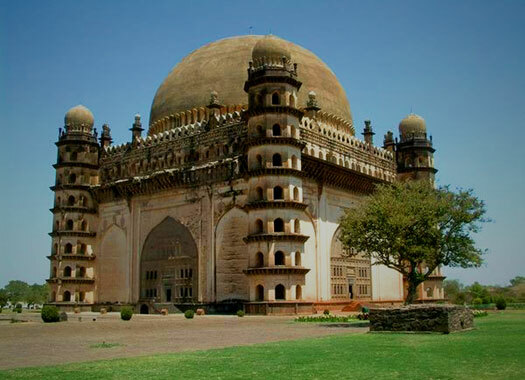 Bijapur was ruled by the Islamic Adilshahi sultans in sixteenth and seventeenth century India. Situated in the Western Deccan plateau of southern India (now in Karnataka state), it had been a province of the Bahamani sultanate until 1518, when the decline of the sultanate forced its break-up. Shortly before that break-up, the Iranian-descended Yusuf Adil Shah was appointed governor of the province, and it was he who took over, creating an independent sultanate, and retaining the provincial capital of Bijapur. The state's borders fluctuated considerably during its existence, although the northern border remained relatively stable, touching on southern Maharashtra and northern Karnataka. To the west, Goa was quickly lost to the Portuguese. The southern border was steadily expanded, finally reaching Bangalore. Along with the other four states which had been created by the break-up of the Bahamani sultanate, Ahmednagar, Berar, Bidar, and Golconda, Bijapur was eventually sucked into the Moghul empire and then the Maratha empire. Bahamani governor. Later founded the Adil Shahi dynasty. Son. Gained throne as an infant. Kamal Khan becomes regent for the young Ismail Adil Shah, but is intent on becoming sultan himself. After imprisoning the sultan he is overthrown and replaced by Ismail's mother, Punji Khatun. During this period there is some enmity with Ahmednagar over the city of Solapur. The Nizam Shah is unhappy because he had been promised the fort of Solapur as a dowry for his marriage to Ismail's sister, Mariam, but the fort was never handed over. The Nizam Shah later tries to take Solapur by force, but is defeated by the adult Ismail Shah. Mother of Ismail Adil Shah and regent. Son of Ismail Adil Shah. Mallu Adil Shah rules for only a short time while his rivals claim he is in the company of evil spirits. His paternal grandmother, Punji Khatun, joins forces with General Asad Khan to depose him and place his younger brother on the throne. Brother. First to assume the title of shah. The Vijayanagar empire is defeated at the Battle of Talikota by an alliance of Deccan sultanates; Ahmednagar, Berar, Bidar, Bijapur, Golconda. Adil shah takes the Raichur Doab as his prize, while extending his territory from the port of Honavar on the west coast and his southern boundary to the line of the Varada and Tungabhadra rivers. Ali Adil Shah renews his attack on the Vijaynagar empire, but this time is defeated, even to the extent that he loses some territory. Within a few months of ascending the throne in 1596, the sultan of Ahmednagar, Ibrahim Shah, is killed in battle against Ibrahim Adil Shah II. The dowager sultana, Chand Bibi, widow of Ali Adil Shah I, is invited by the nobles of Ahmednagar to become the regent for the sultan's infant son. Later in the same year, the Moghul prince, Murad, attacks Ahmednagar with the intent of conquering and subjugating it in the name of Emperor Akbar. He is bravely repulsed by Chand Bibi. However, when she dies in 1600, Akbar succeeds to an extent in taking the Deccan plateau and the sultanates of Berar, Bijapur, Golconda, and Ahmednagar itself, along with the regions of Burhanpur and Khandesh. However, the Deccan remains belligerent and fails to remain under his control for long. The neighbouring sultanate of Bidar is conquered, its ruler imprisoned, and the sultanate incorporated directly into Bijapur. Son. Buried in the famous Gol Gumbaz tomb. The Moghul governor of the recently conquered Deccan territories, Khan Jahan Lodi, makes an alliance with the Nizam Shah of Ahmednagar. He also garners support from Golconda and Bijapur. By 1636, the rebels in Ahmednagar have lost the war, and the Nizamshahi is extinguished. Golconda and Bijapur also have to accept Moghul suzerainty, although Mohammed Adil Shah does this to ensure Ahmednagar's extinction. The former leader of the rebel forces, Shahaji Bhosale, accepts service as Adil Shah's general. Mohammed Adil Shah's campaigns extend the sultanate's borders westwards to Konkan, Pune, Dhabol (modern Mumbai), southwards into Mysore (Karnataka) after destroying the Vijaynagar empire in 1646, and into the eastern regions of Karnataka, parts of Andhra Pradesh and Tamil Nadu. Muhammad's reign also witnesses the revolt of Shahaji (the Maratha noble of Ahmednagar who later rejoins his service), and then the rise of Shahaji's son, Shivaji, who later carves out an independent Maratha state from the Bijapur kingdom. Wife of Mohammed Adil Shah and regent. The Maratha empire under its founder, Shivaji, captures successive areas of Golconda from the Moghuls and the sultans of Golconda, as well as parts of Bijapur from Ali Adil Shah II. The disruption causes destabilisation and revolts within Bijapur. On 12 September, the Moghuls under Aurangzeb conquer Bijapur and incorporate the region into their empire. The Adilshah dynasty ends and eventually the region is fully incorporated within the growing Maratha empire.